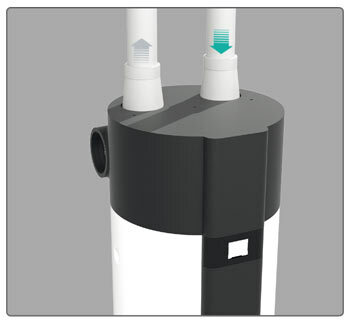 Air Combo PRO is a kettle with heat pump, Pre-assembled and ready to use, used for the production of sanitary hot water. 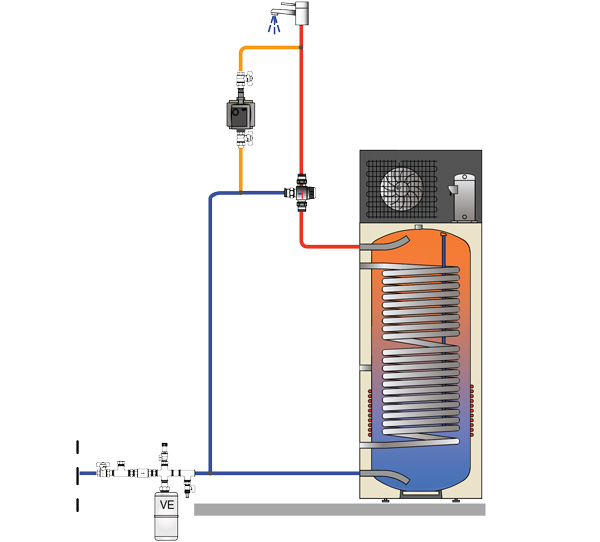 It combines a heat pump air-to-water heat pump and a tank to store water heaters in a single device (holding 200 300 and liters), thus minimizing the overall dimensions. Available in models 2 Air Combo Air Combo PRO S PRO and the latter integrates the auxiliary coil for connection to external energy sources. Leveraging the technology of the heat pump, Air Combo can reduce consumption by up to 70% compared to electric water heaters. Suitable for homes to be in 2 6 people. 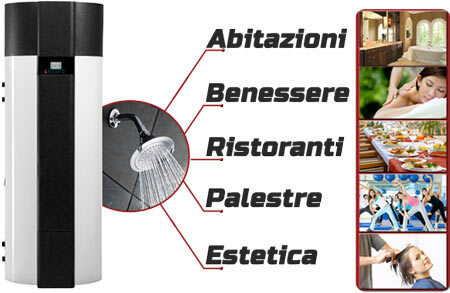 Air Combo can also be installed in cascade to meet high requirements of sanitary hot water, in contexts such as hairdressers, gyms, etc..
Il boiler heat pump uses the aerothermal to heat the water destined to the uses sanitary (the shower, the bathroom, the kitchen). Approximately 70% of energy required for its operation is levied from the outside air, while only the 30% ca. comes from the mains electricity. Connecting Air Combo PRO S to plants producing electricity from renewable sources such as solar or wind energy, you are used to 100% free and clean energy from nature. The combination with alternative sources also allows you to achieve complete energy independence. 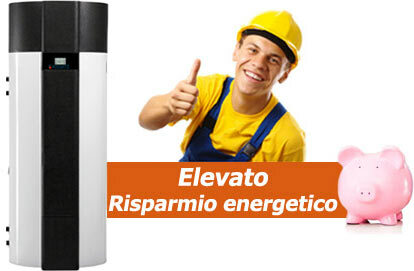 Heat pumps Air combos are designed according to high standards of quality and safety. Just plug it to save. 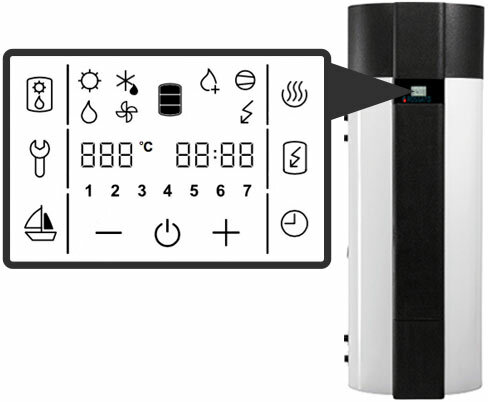 The intelligent control of Air Combo PRO helps make the most of a photovoltaic system. Through dedicated relay (contact consumption) Air Combo PRO S is able to dialogue with the photovoltaic system and use of the electricity produced for auto-feed and heat the water in the accumulation. The hot water thus accumulated in the tank will be available throughout the day, even in the evening / night, without the need for further absorption of electrical energy from the network. 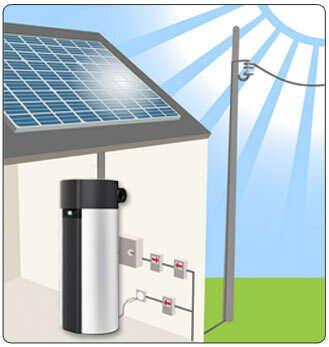 The combination of Air Combo PRO with a photovoltaic system provides hot water and ALWAYS FREE! Leveraging the technology of the heat pump, Air Combo PRO can reduce fuel consumption by up to 70% compared to electric water heaters. The installation and operation of AIR COMBO are extremely simple: the end user to do is plug it in and turn on the switch! And 'possible to combine it with a solar photovoltaic or a solar thermal system to produce hot water so freely and intelligently. Air Combo PRO occupies the space of a normal refrigerator, for which does not require large spaces for installation. 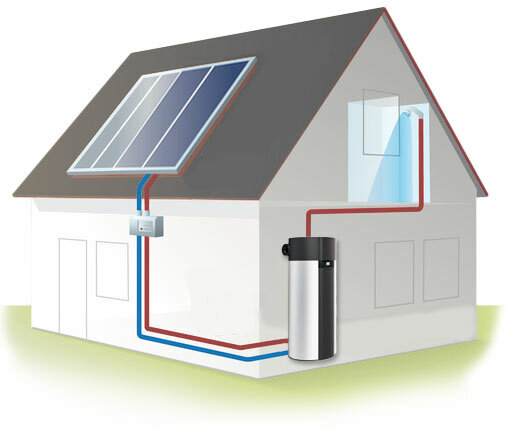 And 'suitable to produce domestic hot water in detached houses and semi-detached and can be installed in cascade to meet the needs of medium and large rooms. It can be placed in the basement, in a laundry room and, in general, in a humid environment in which you can profitably exploit the effect of dehumidification due to the operation of the heat pump. Thanks to fan self, can be ducted up to 10m. 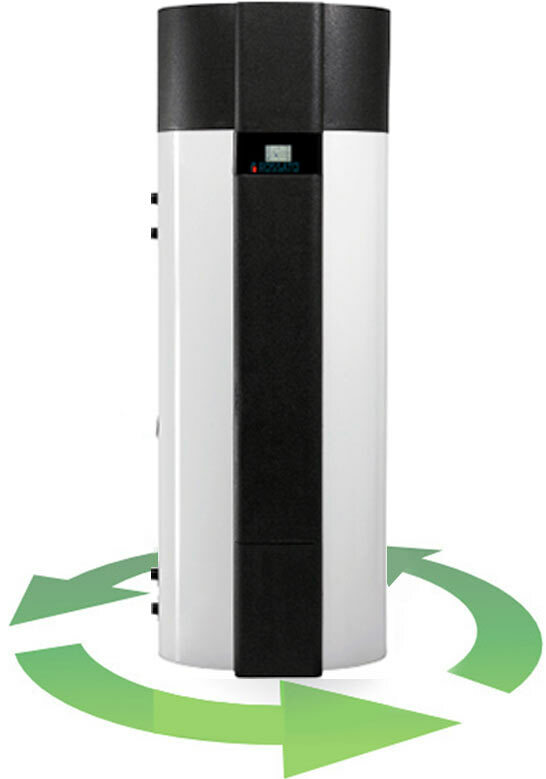 The heat pump Air Combo PRO can be installed with a channeling system that captures the hot air and moisture from the environment and conveys it to the outside. In this way it is possible to reciprocate the inside air without opening the windows and at the same time the heat contained in the extracted air is used to produce hot water. • setting "Absence / holiday"
Thanks to the technology for rotary piston compressor, is ensured a higher energy efficiency and higher coefficient of performance, with a considerable energy saving up to 75 percent. The condenser is wrapped between the boiler and the outer cover of the tank. Positioned in this way reduces the formation of limestone prolonging the service life of the device ensuring greater security. A double vitrification, characterized by a glazing of superior quality and from a bar of magnesium make the tank Air Combo protected and safe ensuring functioning even in the most difficult operating conditions. The heat pump Air Combo is equipped with a big LCD touch screen display that enables you to view and set specific programs for heating and domestic hot water. 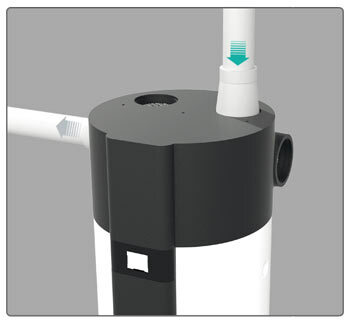 Air Combo thanks to its built-in DC fan allows to convey through channeling cold air outside the building or in any part of the house to be cooled. Air Combo, thanks to simple shapes and the sleek, modern design fits perfectly for indoor installation. 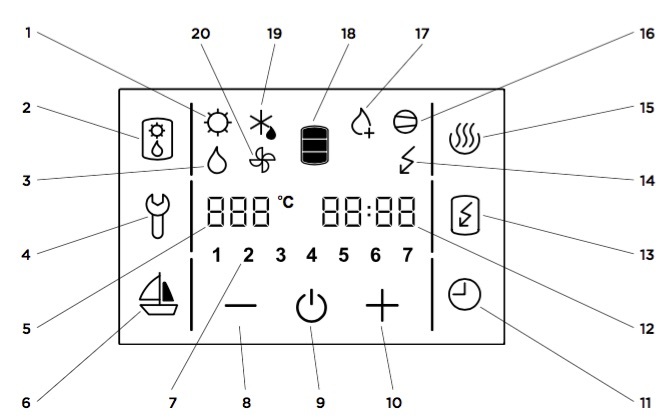 The heat pump is operated via the touch screen LCD (Figure below). Press anywhere on the screen to turn it on. When the screen is on, the display fields of the commands are active. After connection of the heat pump to the water mains and the electric one and with the tank full of water, the pump is ready for operation. The heat pump heats the water from the 10 65 ° C to ° C. Then 65 75 ° C to ° C, the water is heated by the electric resistance. 13. Enabling fast heating "TURBO"
Air Combo is suitable for operation with outside air or ducted air of the indoor environment. During operation of the heat pump, inside the device there is condensation. 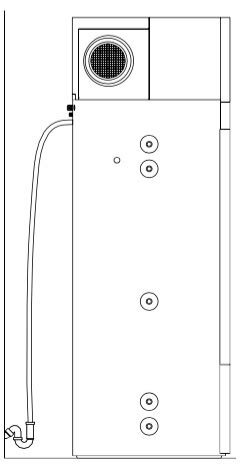 You must download it to the sewer system through a hose Ø16mm by condensation on the back of the heat pump. The amount of condensate depends on the temperature and the humidity. - Use of adjustable legs. For the safety of the operation of the water heater it is necessary to install obligatorily on the water inlet pipe a safety valve to prevent the pressure in the reservoir exceeds the rated value by more than 0,1 MPa (1 bar). The exhaust nozzle on the safety valve must obligatorily be equipped with an exit at atmospheric pressure. For proper operation of the safety valve you need regular checks, remove, if necessary, the scale and check that the safety valve is not blocked. During the control is the discharge opens the safety valve by moving the lever or unscrewing the nut of the same (depending on the type of valve). If in doing so the water flows through the nozzle of the safety valve, the latter works flawlessly. During the heating of the water in the water heater, the water pressure in the tank increases up to the limit set on the safety valve. Because it is prevented the return of the water into the water supply, it may cause dripping from the nozzle of the drain of the safety valve. The dripping water can be channeled into the drain through a tray that must be located below the safety valve. 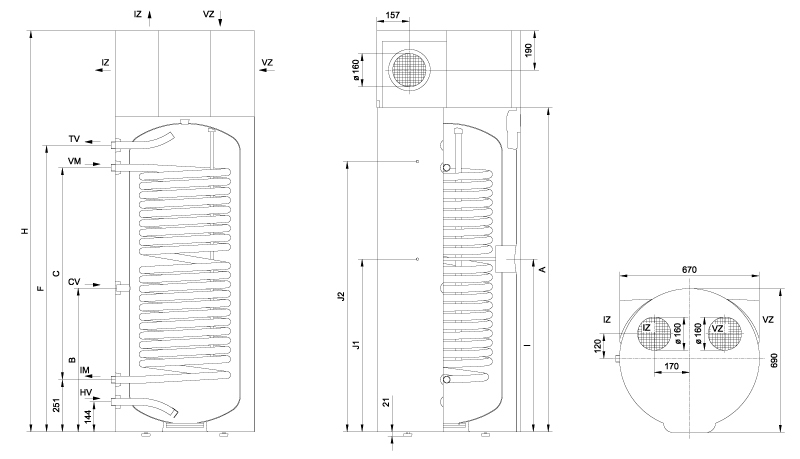 The exhaust pipe located under the release of the safety valve should be positioned straight, vertically, directed downwards and in an environment where there is no risk of freezing. In the event that, due to improper installation, it is not possible channel the water dripping from the safety valve into drain, you can install an expansion tank on the inlet pipe of the heating element. The volume of the expansion tank must be at least 5% of the volume of the water heater. 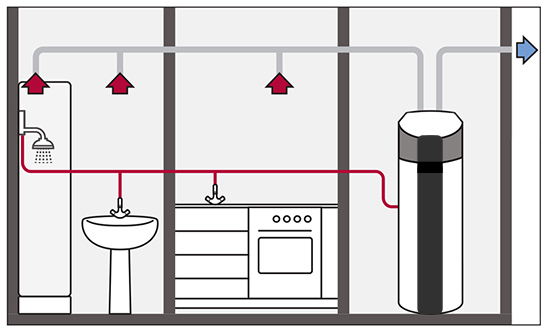 The water heater can be connected to the water supply of the house without reduction valve if the pressure in the network is less than that required on the data label. Otherwise, you must install a pressure reducing valve to ensure that the pressure at the water heater does not exceed the nominal value. 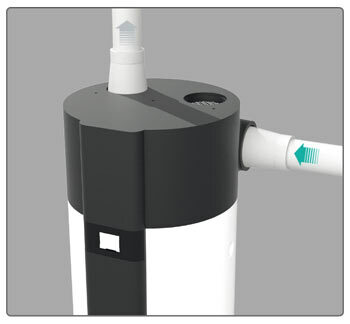 Sample diagram: Air Combo PRO 200 / 300 S with recirculation system for DHW production. 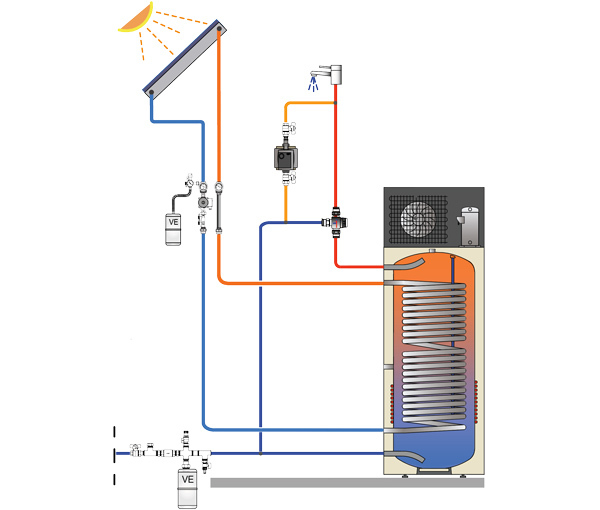 Sample diagram: Built-in Air Combo PRO 200 / 300 S integrated with solar heating system for hot water production.